8 channel 6 function light chaser using 8051. Thisproject is based on AT89S51 microcontroller. Simple circuit and software. 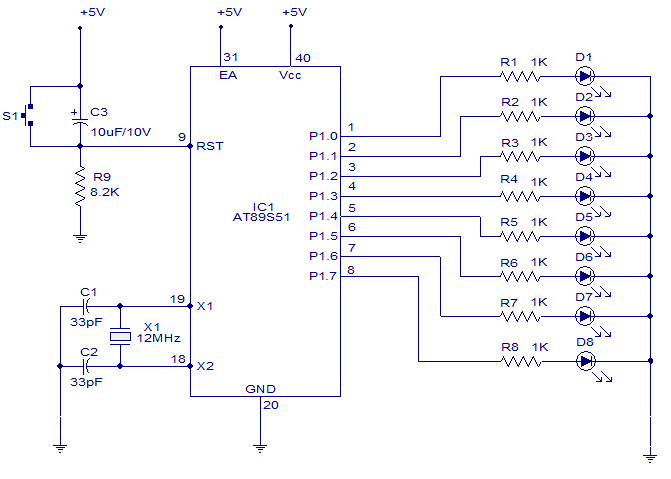 6 function 8 channel light chaser using 8051. A 6 function 8 channel light chaser using 8051 is shown here. The hardware and software of this circuit are very simple and the light functions gets repeated one after another automatically. P1.0 to P1.7 of the microcontroller (AT89S51) are assigned as the output pins. Corresponding LEDs are connected to the output pins through 1K current limiting resistors (R1 to R8). The sequence by which the output pins (P1.0 to P1.7) goes high and low is determined by the program and the LEDs follow this sequence. Circuit diagram of the 6 function chaser using 8051 is shown below. hello can anyone tell the applicatoins of light chaser??? hello can i get the flow chart of the program??? anynone can help me? You can convert the assembly language code to hex code using MIDE-51. Its a good software. what do i must change this circuit if i want to use the 220 volt lamps. Please write about assembler used & attach the HEX code if it is possible.